THP has been fortunate enough to spend time with each release from Devereux Golf, and through the years they have definitely found their niche within the high-end apparel sector. More impressive than that , is that though they have evolved in terms of material blends and fits, their mission statement of “Proper Threads” stands firm, clothing with a purpose, designs for the course but also for day-to-day life. Devereux sent into THP two tops and two bottoms from their most recent release for an in-hand look. All tops were sized large, and bottoms at 36 which are the specific fits of this reviewer. The Riviera Polo is “classic” Devereux in terms of style and looks. The polo features a 3-button Placket with a standard collar absent of the button down look the company utilizes on some of their other tops. The Riviera is straight forward with its solid color design accented by a “Contrast Camo” backing within the inner collar and inner placket, it’s something that will go with anything on or off course. That said, Devereux continues to alter and perfect their material blends and with a Poly/Pima-Cotton mix at play here. The top maintains a traditional weight while offering moisture wicking which is almost a pre-requisite on the market today. 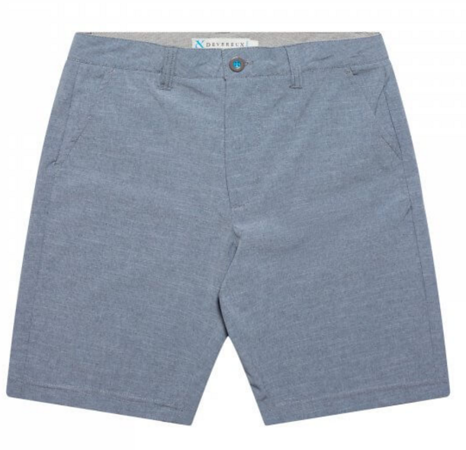 Additionally, the Riviera is definitely a “relaxed” fit that offers plenty of room through the shoulders and chest without appearing boxy, it is definitely more “American” than Euro cut. Patterns are “in” right now, but this reviewer will admit to being a bit pessimistic when hearing a “Contemporary Tropical” print top would be part of this review. That said, it quickly became a favorite and has been worn on the course and at work multiple times now. 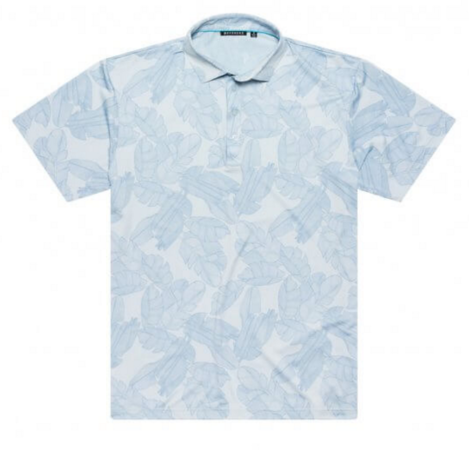 The pattern is actually that of “feathers” encompassing the entire shirt but the blend of the colors, in this case blues, allow it to blend more than contrast. The star though is the shirt design itself, with a 92% poly ratio this is the most “performance” feeling polo from Devereux that this reviewer has worn (and that is with a closet featuring a lot of DVRX). This top is extremely lightweight and breathable with the sturdy stitching expected from a high end brand, and the decision to stick with a 3-button placket was a wise one to balance the look. Much like the “Riviera” discussed previously, the “Maya” is a relaxed/traditional fit that will appeal to those looking for room in the shoulders and chest along with longer sleeves. The feeling and design of the new “Gravity” pants from Devereux were not at all what was expected. They have a unique, almost waffle like, texture and the 71% Poly design makes them amazingly lightweight. The cut is more on the slim/tailored side and fit a bit snug in both the thighs and the lower legs, though not personally preferred, it is right in line with the fashion trends we are seeing now. It should be made clear, by more tailored it is not to mean overly skinny, as this reviewer has a bigger frame and they worked just fine on the course and at work, however, they are definitely not a relaxed fit, but rather more fashion forward. 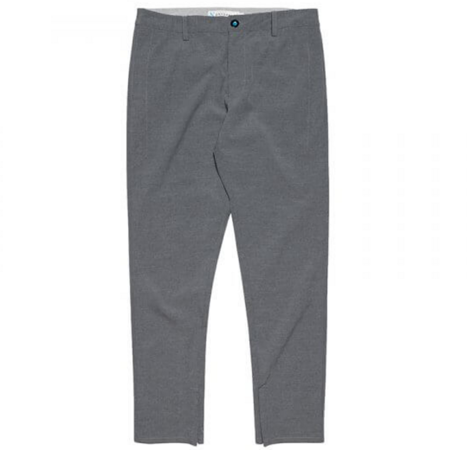 The “Gravity” pants also feature zippers beyond just the fly, on the right rear pocket there is a molded zipper and each lower leg uses zippers to allow the choice of a more natural or tailored fit at the ankle/foot. The materials and design here are impeccable, and honestly merit the price tag. The “Cruiser” shorts feature the exact same textured material as the previously discussed “Gravity” pants, and we feel these are the best shorts Devereux has put out to date. 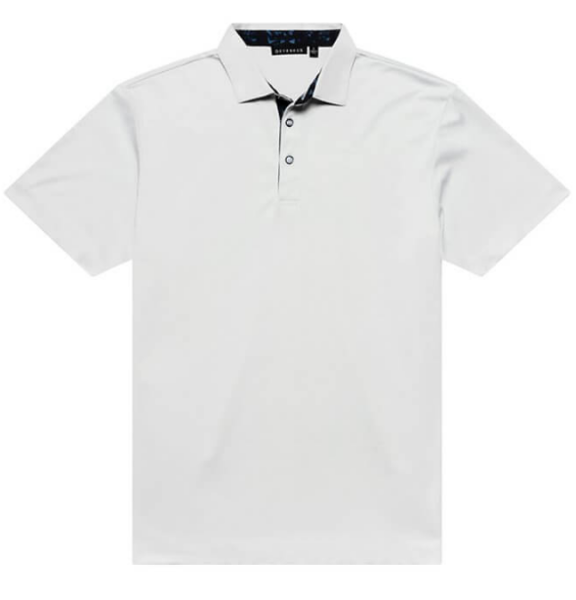 The material is awesome and amazingly lightweight, plus they offer five different colors that will go with pretty much anything from polos to Tee’s both on and off the course. The fit is definitely more tailored in the thighs, but they aren’t what would be considered skinny because as a person with a sturdier frame they were still comfortable. The length will be a personal preference, as with a 9.5” inseam they will either be normal or too short based on the wearers style, for this reviewer they sat just above the knees when standing based off a 36” waist and 6’3” frame. When comparing the two different bottoms discussed in this review, the “Cruiser” shorts were the stars, as they offer performance and style (the crossed belt loops in the back are a stylish little twist), and hopefully we see the company expand this material to possibly another cut. Though the weekend warrior may not know the Devereux brand, the company has continued to dig its feet in and do what they do. They continue to expand their base through their modern styles and having a PGA Tour staffer like James Hahn (and 6 others) wearing the brand doesn’t hurt either. This latest lineup from Devereux is the quality we expect given the price points, and it’s nice to see that while the company keeps pushing their looks and materials, they have maintained excellent quality control. Though still a “smaller” brand, there is nothing small about what they offer for style on and off the course. For more information on Devereux, please visit their website www.dvrxthreads.com. Nice review James. Though the price points are a little rich for my blood, definitely some nice looking and sounding pieces. Great review James. I like the added spandex that we’re seeing in a lot of lines now, definitely help with movement on the course. I do like and prefer the “American Cut” as well vs Euro. The Tropical/Feather shirt you said is not as bad a print either, I would wear it. I am in the same boat for pants, I need more of relaxed fit or the pants can be too snug above the knees. Solid price-points all around for the materials used. I’ve never worn this brand but it seams to be a high quality item. The print is a little old school but the rest looks acceptable. Hybrid Cruiser Shorts are great – have a couple of pair, and have worn them all summer. The pockets are netting and you could wear them swimming after a round.